Edisto Island is a secluded beachfront community located about 45 minutes south of Charleston, South Carolina. 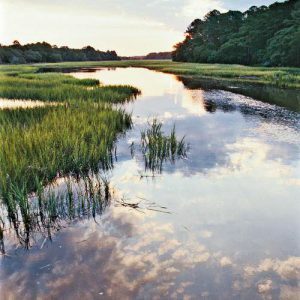 For centuries, Charlestonians have been escaping to Edisto in the summer months to escape the city and soak up the sun on the pristine beaches of Edisto Island. Many locals have second homes on the island and consider it a true retreat for the fact that it hasn’t pushed for major development. There aren’t any motels or hotels, gift shops or beachwear stores lining the island as you enter. Avoiding development hasn’t been easy but it’s what keeps Edisto the charming, close-knit beach community that it is. Edisto Island offers a variety of things to do whether you choose it as a summer destination or for a day trip. A self proclaimed dive seafood restaurant. Locally owned and operated. Go for the fried seafood and sushi nachos. Tropical themed cafe with outdoor seating and casual fare including burgers and hot dogs. Open from 11am-8pm most days. Is a popular spot for brunch on the patio. Classic seafood fare with water views makes the perfect spot for happy hour and sunset watching. A paved 5 mile bike path trails the island. The flat terrain makes it easy to bike and a perfect afternoon activity. The Plantation Course at Edisto offers views of the ocean and lake. Private and quiet spot surrounded by nature and wildlife. 37 public access points to the beach make Edisto very easy to visit. you can find parking alongside the streets at no charge. Dreaming of island life yet? Check out my listing on Edisto Island and see if this little beach community if the right fit for you! Contact Frank Thornhill at frank@askfrankrealestate.com or 843.224.7996 for any questions or to schedule a showing.